There is no shortage of holocaust-themed books. Really, there’s no shortage of excellent holocaust-themed books (Anne Frank, The Boy in the Striped Pajamas, The Pianist, Night, and Maus are just some of the amazing books on the subject). 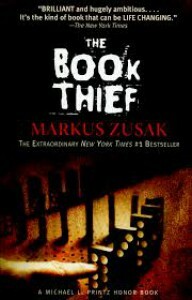 However, THE BOOK THIEF must be added to the list of greatness. This book provides a unique perspective by giving Death the role of narrator. Throughout the book, we are given the perspectives of Communists, children, Germans, and Jews. It makes it a well-rounded journey. There will be tears, some sad, some happy. I wanted to wait until I saw the movie to write this book review, but I still haven’t seen it yet. I heard it’s great, but just from what I’ve seen in the movie trailers, many key ingredients have been changed. Without giving away too many spoilers, the relationship between the young girl and young boy aren’t quite the same, mostly in regards to the knowledge exchanged between them.